KIEV, Ukraine -- Ukraine's anti-corruption reform seems to be a struggle of "two steps forward, one step back." Ukrainian society and the international community were outraged by the severe pressure exerted over Ukraine's newly established National Anti-corruption Bureau (NABU) in late autumn/early winter. Attacks intensified right after detectives from NABU served a few notices of suspicion in politically sensitive cases on defence-sector corruption. Pressure appeared almost simultaneously on different fronts - from legislative initiatives watering down the subject legislation to direct counteracting of the ongoing investigations. This may have created an illusion that Ukraine is following the post-Orange Revolution path, where resistance to change from Kiev's political class led to the failure of reforms. However, this narrative ignores the fact that Ukraine is now showing the greatest progress in fighting political corruption since its independence. Indeed, the old guard's tireless efforts to undermine anti-corruption reform is actually the strongest evidence that, this time, Ukraine's fight against corruption is for real. An electronic procurement system that boosts competition, the outsourcing of medicines procurement to the international organisations, the decentralisation of powers and funds to local communities, the streamlining of public services provision, cleansing the banking system, electronic asset declarations of more than a million public officials - all of these things, to differing extents, are working towards eliminating corruption in Ukraine today. Robbed by former president Viktor Yanukovych and his allies, and almost facing bankruptcy, Ukrainian society unified to demand that the vicious cycle of impunity be broken and top corrupt officials face justice. International donors, who came to support post-Maidan Ukraine, responded to the demand of Ukrainians and required real anti-corruption as a condition for their assistance. Both of the International Monetary Fund's (IMF's) loan programmes and EU assistance, as well as visa liberalisation, were linked to the establishment of the "independent anti-corruption agency with broad investigative powers" to bring state officials to justice. This synergetical approach proved to be successful. However, because NABU is purely an investigative agency, it is only the first link in a chain of anti-corruption institutions. NABU detectives are supervised by the anti-corruption prosecutors who were also selected in open competitions after Maidan, and they work in an autonomous part of the prosecutor's office. But while progress has been made in investigating and bringing high-level corruption cases to the courts, the unreformed judiciary remains the greatest obstacle to ending corrupt officials' impunity. Indeed, the unreformed judiciary remains the champion of society's distrust in public institutions, with a level of confidence equal to minus 75 percent. This explains why corrupt officials - who understand that a truly independent anti-corruption court could end their impunity from justice - continue to fight strongly against the establishment of independence. Nevertheless, despite dealing with an unreformed judiciary, the investigation already represents a genuine success story. Although NABU has been fully operational for two years, over this relatively short period of time it has become a genuine game-changer - which scares Ukraine's corrupt political elites to death. As of late 2017, NABU brought 173 indictments to court, continued investigations in almost 500 criminal cases and survived dozens of political attacks that distracted from NABU's core activities. Among those arrested or investigated by NABU are the heads of state-owned enterprises, law enforcement officers, judges, chiefs of governmental institutions and MPs of various political affiliations - those who for decades belonged to the so-called group of "untouchables". NABU focuses on fighting corruption in the most strategic sectors: gas and energy, defence, and the rule of law. Sometimes, the very fact that an unbiased investigation exists was enough to return public funds back to the state treasury. For example, after the announcement of an embezzlement case against MP Oleksandr Onyshchenko, involving a state-owned gas firm, the company suddenly reported a profit of almost €5 million ($6.2 million) in only four months after previously reporting a profit of only €740,000 ($917,000) over two years. Meanwhile, the then acting tax administration chief, Roman Nasirov, another suspect in the related "Onyshchenko" gas fraud case, now faces a trial upon indictment for the abuse of power that caused more than €58 million ($72 million) in losses for the state budget. Other examples of NABU's impact abound. Unique radiological equipment, purposely purchased overpriced back in 2012 at the expense of the state budget, was hidden for five years instead of serving for diagnostics and medical treatment of childhood cancer. It took less than a month, however, for NABU detectives and anti-corruption prosecutors to find it. The equipment is already contributing to the treatment of Ukrainian children in their fight against cancer. Although it is a material evidence in the criminal case, the investigators allowed using it for its intended purpose before the case finishes. Over the last year, Ukrainians have gotten used to seeing major corruption cases in the headlines. Recently, NABU finished the investigation of a €6.4 million ($8 million) embezzlement scheme by former MP Mykola Martynenko, who is also believed to be a key donor of the 'Narodnyi Front', Ukraine's second largest parliamentary party. Notices of suspicion were served for the misappropriation of around €4 million ($5 million) in ministry of defence funds during fuel procurement. 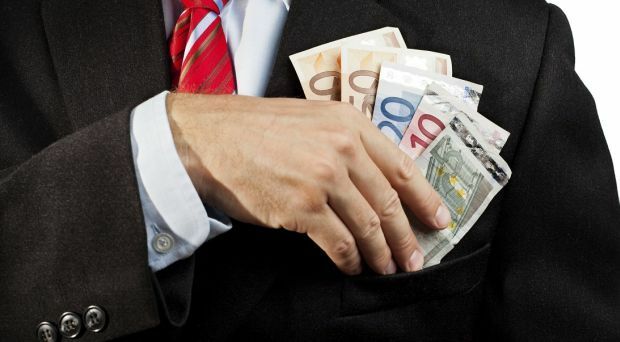 The embezzlement of €7.5 million ($9.3 million) on the investment project was disclosed. There were also revelations of the misappropriation of sugar from the state storehouses, worth €6 million ($7.4 million) and other similar scandals. In cooperation with the US law-enforcement agency, the FBI, a number of highly professional undercover operations were held over the last year. Following a successful closing stage of the investigation into illegal amber mining, NABU released a video recording of its undercover investigation which shocked Ukrainian society by demonstrating the insolence of corrupt businesses in Ukraine. It looked much like a scene from a film: fancy restaurants and relaxing music in the background. There were months of negotiations about mining and exports of Ukrainian amber to Arab countries, with MPs offering their lawmaking services to an alleged representative of the foreign company. Nevertheless, it was not a film - it appeared to be a reality. Anti-corruption investigations of this scope, and without political abuse, simply have no precedent in Ukraine's previous history. Up to 2013, only a handful of top officials ever faced indictments in corruption-related cases - and even the most prominent of these were recognised by the international community as politically-motivated persecutions rather than genuine anti-corruption cases. NABU's impact means it enjoys the highest level of public trust among other law enforcement bodies after the army, while representatives of big foreign businesses working in Ukraine even awarded the Bureau the title of anti-corruption champion of 2017. Post-Maidan Ukraine will never be the same again. Although frustrated and often tired, Ukrainian society still courageously fights for the sovereignty, democracy, accountability and the rule of law, and it will not allow Ukraine's politicians to turn back the clock. Despite Ukrainian corruption being much more widely reported - both internally and internationally - after the Revolution of Dignity, this does not mean it grew worse. It only means that more corruption is being revealed and investigated, and better transparency imposed. Now the next task is to ensure accountability. And while a a key struggle - the creation of a genuinely independent anti-corruption court based on the Venice Commission's recommendations - still lies ahead, it is critically important to recognise change-makers like NABU that are already in place, and mobilise all the efforts to protect and boost them. For the first time since independence, an evidence-based approach to fighting corruption has started to work in Ukraine. With the help of its international partners, Ukraine is on the right track.